Supporters of lifting the charter school cap listened to Governor Charlie Baker testify at an education hearing on Beacon Hill last year. 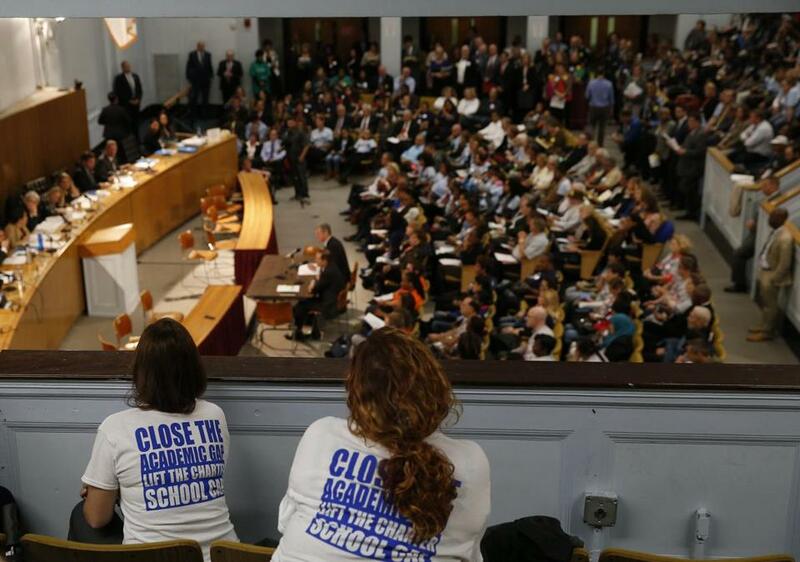 A Beacon Hill watchdog group released a report Wednesday finding that charter schools have not been a significant financial drain on traditional public schools, undercutting a central argument raised by teachers unions and other groups opposed to opening more charters. The Massachusetts Taxpayers Foundation study, paid for by the pro-charter Boston Foundation, shows that per-pupil spending in traditional public schools has grown at about the same rate as per-pupil spending in charter schools over the past five years. Charter schools are public schools. But they are often not unionized and have a freer hand with budgets and curriculum than do traditional public schools. A ballot measure that goes before voters this fall would allow for the creation or expansion of 12 charter schools per year. The growth of the charter sector has had an impact on school finance. When students leave traditional public schools for charters, they each take several thousand dollars in aid with them. The total transfer is expected to reach $450 million this fiscal year. But that doesn’t necessarily mean overall spending on traditional schools decreases. Boston, for instance, has compensated for the loss in aid by diverting funding from other city departments into the schools, according to a report from the Boston Municipal Research Bureau released earlier this year. The new study from the foundation does not provide a detailed look at how individual districts have managed to keep spending more money on traditional schools. But it does provide the bottom-line figures. In the eight school districts that accounted for 75 percent of the growth in charter school enrollment over the past five years — Boston, Springfield, Lynn, Lawrence, Lowell, Chelsea, Fall River, and New Bedford — per-pupil spending on charter school students grew 11.8 percent, according to the report, while per-pupil spending on non-charter students grew 10.1 percent. Figures for the individual districts, provided to the Globe, showed significant variation. While the difference was only slight in Boston — a 19.2 percent increase in per-pupil spending on charter students versus an 18 percent increase for traditional school students — it was more pronounced in Springfield: 12.3 percent for charter students versus 5.8 percent for non-charter students. Still, the overall impact on these eight districts has been small, according to the report. And the study suggests that the consequences for districts with smaller charter school growth has been minimal. In Marlborough, which the report holds out as a typical Massachusetts district — its median income and state test scores are about average — per-pupil spending on charter school students increased by 13.3 percent over the past five years, while spending on traditional public school students grew by 25.8 percent. Charter supporters frequently argue that the funding mechanism for the schools is fundamentally fair — when a student leaves a traditional public school for a charter, the money follows. And the Massachusetts Taxpayers report suggests the state is sticking to that basic concept: 3.9 percent of public school students attend charters, according to the report, and charters get 3.9 percent of all education spending. “While people can disagree, certainly, on the educational merits of charter schools, the data doesn’t show that charter schools have taken funding away from traditional public school districts in any way that’s disproportionate to the charter school attendance,” said Eileen McAnneny, president of Massachusetts Taxpayers. But charter school critics argue that the “money follows the child” dictum is not as fair as it sounds. When a student leaves a school for a charter, they say, the traditional school retains extensive overhead costs. Charter school supporters note that traditional schools get reimbursed, for a time, for the lost funding. State lawmakers, though, have not fully funded that reimbursement program in recent years.